The glitz of the globalised world draws many to pursue popular professions that are a sign of the times, but there are some who choose to take a career path in the service of the country instead. On a sunny afternoon at Government Higher Primary School in Jyothipura, Bengaluru, a bunch of boys are busy playing football. Amid much yelling, the children are having the time of their lives, kicking the ball around, without a care in the world. As this scene plays out, nearby, under the soothing shade of a tree, sits another group of boys, who run out, eager to interact with visitors to their school. Among them is Madan, a Standard V boy eager to talk about his ambitions, which include being an officer in the Indian Administrative Service (IAS). Madan comes from a household which is among many that is responsible for fulfilling India’s food requirements – his father is a farmer and mother a housewife. 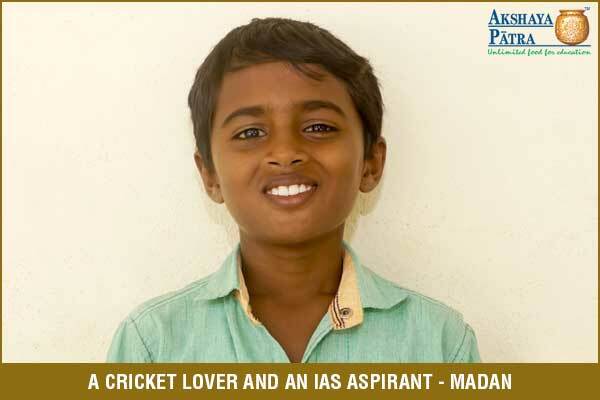 Madan says that Akshaya Patra meals fuel his love for education. “I like all the meals served by Akshaya Patra, but Bisi Bele Bath is my favourite. After having the food, I concentrate better and easily comprehend my lessons in class.” He counts English and Social Studies among his favourite subjects and the lady who teaches them, Miss Parvati, is his favourite teacher. A studious boy, Madan is a favourite with the teachers too. His disciplined nature and academic inclination is commended by his teacher. He takes inspiration from the late IAS officer DK Ravi, whose interview he once heard on television. He has been his ardent admirer ever since, finding the late officer’s personality, dedication towards his profession and his intelligent responses to questions asked of him quite impressive. After the untimely death of DK Ravi, Madan was greatly pained and aggrieved when he heard the news. However, the rainbow in this cloud is that this unfortunate event strengthened his resolve to oversee district administration in the future. Madan’s extracurricular interests include sports, cricket in particular. His friends call him a fair and competent sportsperson. Unsurprisingly, his favourite cricketer is Mahendra Singh Dhoni. He, however, harbours no ambitions for cricket and wants to treat it as a hobby instead, focusing on his IAS ambitions.